Not unlike many other products in use in the metal producing industry, slagpots are consumable goods with a limited lifetime! The right choice of slagpot material, the design, and, most importantly, the slagpot producer and the user determine the lifetime of a slagpot and therefore the resulting cost for your company. Within the last decades, an enormous knowledge-background around these issues has been established at the suppliers and users. This accumulated experience and leveraging the current capabilities of computer-aided calculation methods result in today’s state-of-the-art “optimal slagpot”. The basic, seemingly simple, task is to pick up and transport a predefined amount of liquid slag from one place to another and to dump it. Most of the time this is indeed already challenging, because the space available to fill the slagpots is limited and the route to the dump-yard is very narrow, curved or simply very long. Special slag carriers and other specialized machinery and even a reconstruction of the site are typical solutions for these problems. Because of the common need for individual solutions, there is simply no standard design for slagpots and as a result, every operator requires their own custom-designed equipment. The slagpot construction is the result of these criteria and the base data provided by the smelter and the carrier manufacturer. GVA Krefeld bundled the customers and transport requirements by GVA KnowHow to construct the individual customer Slagpot. To slow down the kinetic energy of the pouring stream (slag and metal), the liquid level needs to rise quickly, so that the pouring stream can hit the so-called “swamp”. For this technique the slagpot bottom needs to be designed as a calotte. To reach the required slagpot volume the wall adjacent to the calotte has a bevel of 15°. Seen from the above, the slagpot can be oval or circular. An oval shape can be beneficiary for the emptying of the already cooled down slag scull if the slagpot is be tilted over the greater diameter axis. Greater diameters are in general more favorable than smaller ones, as this simply reduces the risk of the slag stream hitting the slagpot-wall and also causes a bigger gap between the pot wall and the slag as it solidifies. This larger gap slows down the heat insertion into the slagpot wall and it also allows for easier emptying. Preferred slagpots are constructed with ratio of diameter to height of about 1:1. If slagpots are to be transported by rail, they are typically designed to hang in a ring corset. However, most of the slagpots need to stand safely in an upright position in a work configuration. To allow both, GVA slagpots are equipped with “elephant feet”, which keep the body off the ground and assure the air cooling of the slagpot bottom. 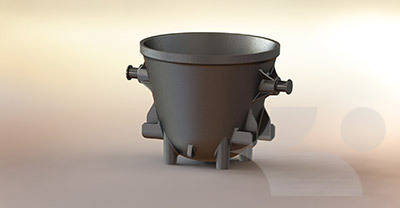 This choice of “feet” is also an advantage for the production of the casting, because slagpots are commonly casted upside down and the feeder head can therefore be easily applied at the feet. The transport and handling with crane or a special road carrier system requires trunnions, which have to be above the center of gravity. 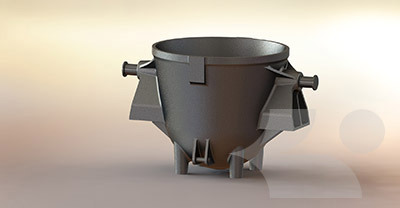 The connection of the trunnion to the slagpot body with the optimized slagpot is designed so that the load of the weight is distributed into a large segment of the slagpot wall. The shrinking and expanding of the body should not be constrained, which averts premature deformation of the slagpot body. Similar connection designs exist for other essential elements like reaction pads, locking pockets or shackle eyes. If a high level of “erosion” can be expected due significant portions of metal in the slag caused by the production process, the slagpot wall will be designed with different thickness. The classic material hematite has been more or less replaced by steel cast. According to the experience of the last 30 years a steel cast with a low carbon and high manganese content has been proven most suitable (GVA Special Cast Iron). This material has similar mechanical properties like for example G17Mn5 according to EN 10213, with a low tendency to distort and easy to weld. 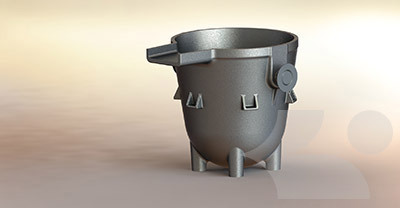 In the past, there was a temporary, observable trend with customers preferring spheroidal cast iron slagpots because the production price was lower. The resulting better shape-stability unfortunately has the downside of causing more cracks and the higher effort for welding makes maintenance more difficult, while the same property lets stickers occur less frequent. Slagpots made of spheroidal cast iron are commonly used only in very specific scenarios like heavy- and light metal smelters, or steelworks with small amounts of slag. The preferred spheroidal cast iron is ferrite with especially low silica content (GVA Ductile Cast Iron). To make sure that the life time cycle of the Slagpots in use will can be elongate as long as possible GVA produces oberating instructions for the customers and users. Because the problem potential is significant, and special issues often surface at the individual customer site, this article can only present some fundamental facts and best practices. To permanently optimize cost for the use of slagpots it is therefore essential to for slagpot supplier and operator to stay “in touch”.